Today I’m going to be sharing a minor but never the less annoying pet peeve of mine. I’m talking about the quality of grill brushes you find in most stores that sell grilling equipment. Or rather, the lack of quality is more like it. I know, brushes for cleaning your grill grates aren’t the most exciting of topics, but believe it or not, it is a rather important one. In point of fact: one of the most often used pieces of equipment before and after you use your grill is a grill brush. More on that later. So after finally finding one I like, I knew I had to share the Qually United grill brush with you. The majority of grill brush options available are cheaply made, can damage your grill grates or are just plain inadequate for the task of cleaning your grill properly. That’s right, I said it. The majority of them! If they last you more than a season of grilling, then you’re not cleaning your grill enough, or you need to start grilling more often. I highly recommend doing more of both! 🙂 Even though it is one of the most used tools, wouldn’t it be nice if it were only an afterthought and not something you had to worry about? Using a grill brush before and after cooking not only prolongs the life of your grill, it is critical to the taste of your food during your next cookout. So why wouldn’t any old bbq grilling brush do? Well, we already know that every grill requires maintenance on a regular basis to prolong its life and keep your food tasty and safe. But did you know that many of these inferior brushes just aren’t capable of doing that after the first few uses? The soft wire brushes wear down quickly and don’t do a good job of removing leftover food and grease. A cheaper product can actually damage the grates of your grill with their cheap steel wire brushes causing them to scratch and rust. With a cheaply made brush, you will also have to put more effort into working it, which in turn quickens its demise. Cleaning your grill grates shouldn’t feel like a chore when in reality, it should only take less than 30 seconds. The Qually United grill brush solves these problems and more. The three brush in one design covers a maximum surface to clean your grill 5 times faster. 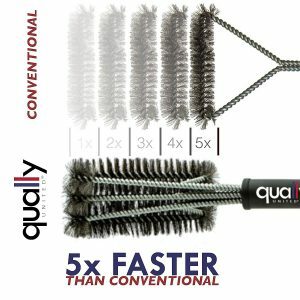 The Qually is a universal grill brush that can be used on most grills with a woven steel wire brush design so it won’t scratch your grill gate surface. The strong and long handle makes it easier to apply enough pressure to remove even the most stubborn left over food particles. And I’ve barely even touched on the health and safety issues yet. This should be obvious, but apparently, not everyone considers it. (I’m talking to you Dad). By keeping a clean grill, you are making sure you get rid of any left over food stuck to the grates. This, in turn, gets rid of the nasty, greasy, sooty leftover flavor and reduces the risk of cross contamination to your food. Perhaps more importantly, cheap grill brushes don’t last long, fall apart, and start to leave dangerous things behind on the grate. In 2012, the CDC issued a warning of injuries from inadvertently swallowing grill-cleaning brush bristles that had been left on the grates and then got stuck to food after cleanings. This doesn’t mean that you should avoid grill brushes altogether, it just means you should avoid those cheaply made brands and look for something more durable and with a solid reputation. 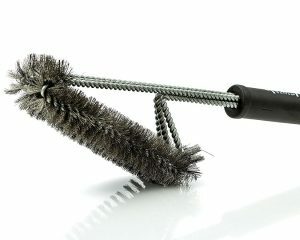 Selecting a quality brush with woven steel wire bristles that are tightly anchored to the brush head is the way to go. Brushes with fewer bristles that are cheaply made tend to wear down quickly and warp. The bristle head deteriorates and the risk of losing bristles increases. Just to make it clear, this is actually rare, but it does happen. Why risk it? It is always best to clean your grill with a grill brush before and after a grilling session while the grill is warm. Now just run the unique three brushes in one design back and forth over your grill grates until every bit of residue is gone. 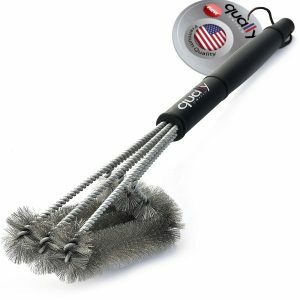 Qually United’s grill brush is a heavy-duty BBQ grill brush with many unique features for your grill cleaning needs. Out of the box, you have a long 10-inch durable handle that keeps you safe from the heat while making it easier to apply the pressure needed to really deep clean your grill. Made of stainless steel and with a heavy duty plastic handle, this grill brush will last longer than the competitors. 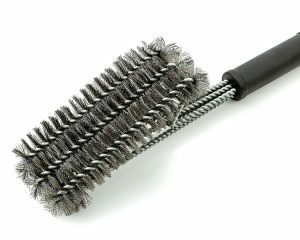 The brush head comes with the unique three brushes in one design reaching the maximum area to clean your grill grates five times faster. Each brush features its own equivalent stroke so you can remove even the most difficult stuck on residue and it cleans between the grates. The innovative 360-degree rotator makes cleaning the grill almost effortless. The brush has a perfectly angled handle and head making it easier to clean every spot on the grates. Made of woven steel wire, not only is it durable, it won’t scratch or leave abrasions on your grill grate surface. This universal grill brush is compatible with multiple grill types. Everything from charcoal, electric, gas, infrared and every type of grill in between. Rust proof and dishwasher safe for easy cleaning. Who Should Buy The Qually United Grill Brush? If you have never used a quality grill brush, then you don’t know what you are missing. There are better things you could be doing than standing over a hot grill endlessly scraping away and moving grease from one side to the other. Like the old saying goes, “work smarter, not harder”. 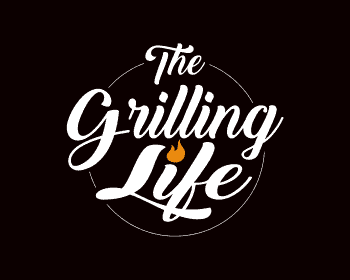 Every griller knows the importance of grill maintenance for prolonging the life of your grill. The cleaner your grill, the better your grilled food will come out. Nobody wants to taste last week’s chicken bits left over on the grates. That is just gross, and unsafe. And then there is the money you will save from buying a quality grill brush the first time. Having to replace a cheap grill brush a couple of times a year starts to add up. So if you are a griller who wants to save money and prepare the tastiest, safest food possible, the Qually United grill brush is for you. If you have a smaller grill with tight corners, then this brush may not be for you. The larger brush head can make it a little tricky to get into those tight angles but with a little maneuvering, I was able to figure it out. Never the less, there may be better options out there for you if this is your case. Effortless Cleaning with three rows of brushes. Universal grill brush can be used on gas, charcoal, porcelain, infrared and smoker grills. The woven steel wire won’t scratch surfaces. A long and strong 10-inch handle keeps you away from the heat. Durable stainless steel and heavy duty plastic will last longer. I really liked the quality and construction of this grill brush. Its sturdy plastic handle was comfortable in my hand. The long handle made it easy to really lean into it and pressure clean the grates. While exerting hard down force, I did not worry at all about the handle breaking. I had a hard time believing the reviews that state that it cleaned almost 75 percent faster, but I experienced similar results. The Qually United grill brush ranges from $14.95 to $39.95. At the time of this writing, it was $14.95 on Amazon. Qually United shows its appreciation for customers by offering awesome customer service and warranty. I have seen time and time again that they have been willing to replace their product free of charge if it doesn’t live up to its reputation. Take a look at the reviews if you don’t believe me. They offer a no risk – 1 Year Warranty – 100% Money Back Guarantee! This coverage is worth the price alone if you ask me. 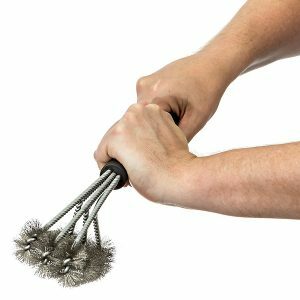 The Qually United BBQ brush is a great overall grill brush for the busy griller. Overall it is a solid buy with a company that will help you if you have any problems, which makes it an even worthier purchase. With over 2,100, five-star reviews on Amazon, the Qually grill brush is one of the best you can buy. With all the positive reviews, it looks like it is worth every penny. *This rant was brought to you by cheap grill brushes everywhere. I hope this Qually United grill brush review was helpful for you. As always, if you or someone you know is in the market for a new grill brush, or you find this information useful, please consider sharing it with your Grilling friends and on social media! If you would like to leave a comment or have a review of your own to share on the Qually United grill brush, please do so below. We always welcome your input.